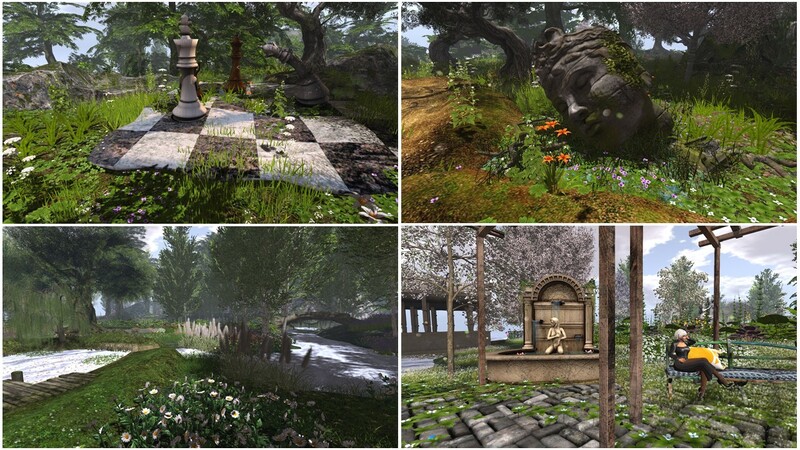 Inspired once again by scoop.it SL Destinations and the pictures published by AJ (anyajurelle) in her blog “AJ’s Second Life – Travel Guide” I had a look at Inara Pey’s blog post “Destiny Gardens in Second Life” and decided to visited Destiny Gardens. 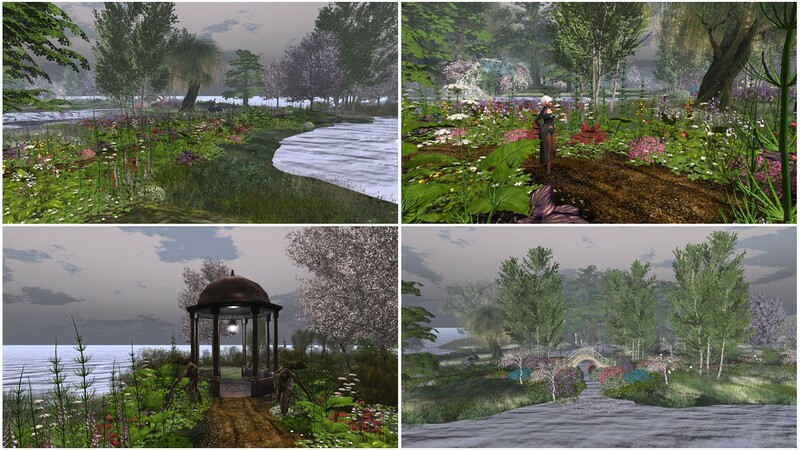 Destiny Gardens is a full, moderate sim owned by Destiny Milos and as I learned from Inara’s post it was primarily landscaped by Adalynne Romano (AdalynneReed). To put it in one word – it is just beautiful! At the landing point are places to sit and to play chess and I discovered a sculpture created by Mistero Hifeng. During my visit I came across of some more of Mistero Hifeng’s sculptures, most of them I had seen before. They add perfectly into the beautiful environment. The landing point area, that is located on a hill, I went down to the shore and took the trail that leads you around the island and into the inside. I personally was overwhelmed by the views. The ground is covered by blooming wild flowers, the trees are planted thoughtfully to provide shade and to add to the composition of colours. The trails lead over all kinds of bridges that you’d expect in a garden. And there are a lot more places to stop and sit down admiring the beauty of nature, a true virtual paradise. 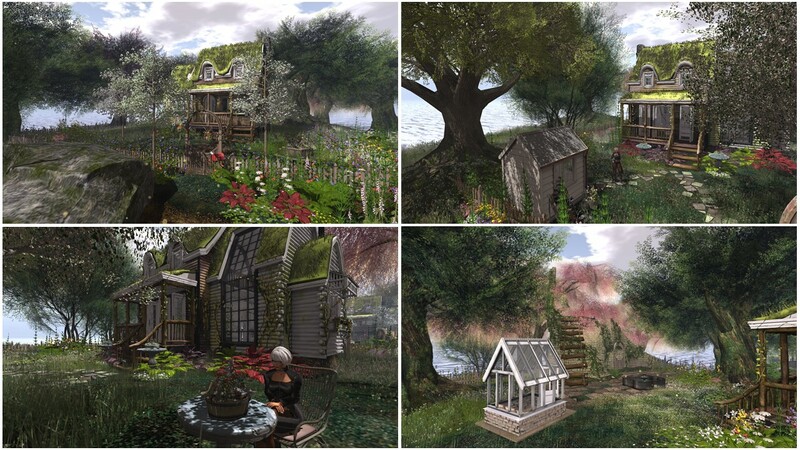 Exploring Destiny Gardens you will find 2 residential homes that blend in perfectly, their roofs are covered with moss, their own gardens are neat and offer more places to sit again. I also found an French garden with accurate cut hedges and, what a contrast, with several buxus cut into the form of a bunny. Behind the formal garden is another patio that invites to sit down and relax. I spent an hour admiring Destiny Gardens and taking pictures and had a very enjoyable time. Thank you, Destiny Milos for providing your lovely place to the public.